New Year's Day presented me with a logistical problem. I wanted to run at Riddlesdown and Roundshaw parkruns. However, the roads where I am currently living (in central London) are within the area that was closed to traffic on New Year's Eve and there was no guarantee that they'd be open in time for me to leave on New Year's Day. So on Sunday evening I put phase one of my travel plan into action and parked my car in Bermondsey, which is just 7 minutes away by tube. Phase two of the plan came into play on New Year's Day, when I woke up after having less than three hours sleep, and took the tube to Bermondsey to pick up the car. Fortunately everything went to plan and by 7.15am I was listening to the wife's Lana Del Rey CD and driving through the deserted early morning roads, with the exception of Brixton High Street where the party was still on-going. My plan was to run the official Riddlesdown parkrun at 9am, drive across to Roundshaw Downs for their 10am event and then drive back to Riddlesdown for a freedom run at 11am. 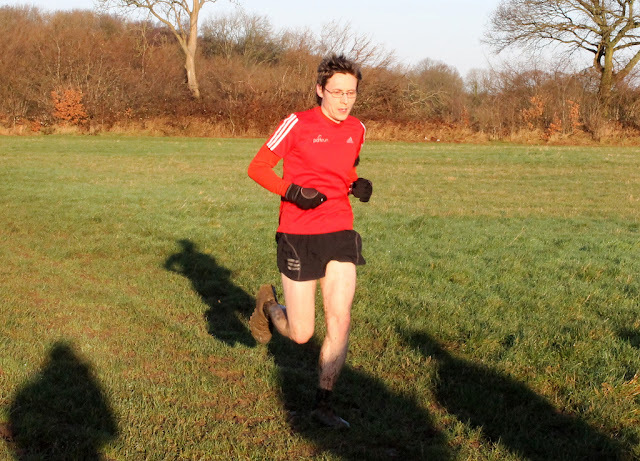 I arrived at Riddlesdown at 8am, got changed into my trail shoes which were still damp from running at Hilly Fields parkrun on Christmas day, and spent the next 40 minutes loitering around the registration area. At 8.55am I had a short 1km warm up run with Pete and discovered just how muddy and waterlogged the course is at the moment. Even in trail shoes I found it difficult to find any traction whatsoever. Onto the run itself and the other parts of the course weren't any easier to negotiate. The end of the trail section was particularly wet and at one point my foot went so deep down into a puddle I was convinced that I was going to have to swim out. It was all good fun and I finally made my way around the course in a time that, on the surface, looks quite sedate but in reality was bloody hard work! My right calf felt a little sore at the end. I had my barcode scanned and swiftly continued back to the car. 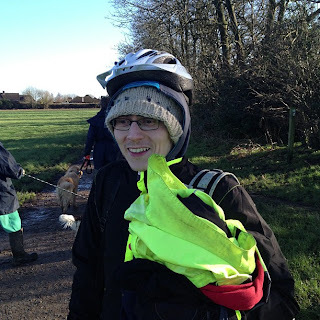 Once there I changed into my second pair of socks and dry shoes and made my way down to Roundshaw. I arrived at Roundshaw at 9.50am, changed back into my soaking wet trail shoes and walked over to the start line where I found a few familiar faces waiting. Once under way, I spent to first 2km of the run chatting to fellow Riddlesdown runner, Graeme (congratulations on joining the 50 club!). 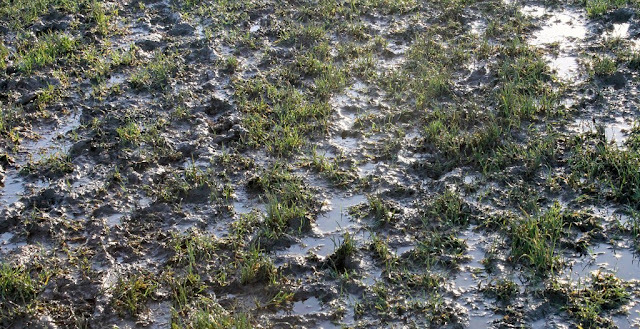 The course at Roundshaw is all on grass/mud and is a two lapper. The first 2k of each lap feels like a gradual climb and then you have a fast downhill section right at the end. 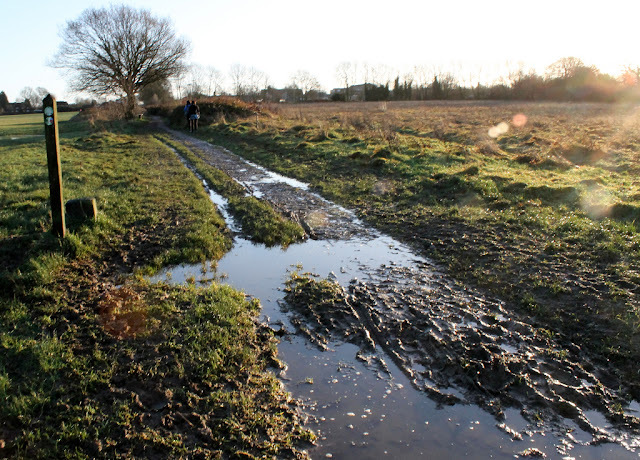 The terrain is pretty similar to Riddlesdown but nowhere near as waterlogged/muddy. At the start of the first downhill section, I upped the effort and did my best to maintain it until the end. Once finished, there was a little time for some chatting but I was soon back at the car and changed back into my dry shoes and third pair of socks of the day and then got back on the road to Riddlesdown. My right calf was still sore and I was starting to think that I should be satisfied with the 11k that I had already run. When I arrived back at Riddlesdown, I had a chance to evaluate the soreness in the calf. I decided that I didn't want to risk running another 5k. So I put a few extra layers on and then changed into my trail shoes to avoid making my clean shoes muddy, and went over to attempt to help in some way. There wasn't really anything left for me to do so I just tried to give the freedom runners some encouragement and then carried a few bags and a cycling helmet back to the registration area for some of the other runners. Back at the car for my final sock change of the morning. I was now in my fourth pair and it wasn't even noon. However, even though my feet were freezing, they were at least on the dryer side than they would have been if I hadn't brought the extras. Once everything had been packed away, I went off to pick up mrs7t and the toddler and then went onto the Horseshoe pub to have our annual New Year's Day Riddlesdown parkrun lunch, which rounded off a very brilliant start to the new year! Thanks to the official photographer, Sophie, for the main photos from Riddlesdown, and to Nicki for the 'how many hats?' photo. Sadly there were no official photos from Roundshaw and I completely forgot to take any myself.